A chiminea is one of the most versatile and aesthetically pleasing investments that you could include in any backyard landscaping and patio design endeavor. In addition to simply being pretty and providing a conversation piece any chiminea, regardless of size or material, can provide the perfect inviting warmth to ward off the chill of summer evenings. 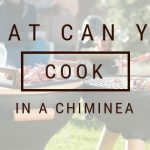 What’s more, chimineas make wonderful ovens for baking all sorts of things in. Food cooks quickly from the bottom and surrounding heat. Basically anything that you would bake in a standard oven can be baked in a chiminea and they cook some things like breads and pizzas even better than an oven would. 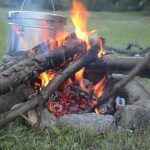 While a variety of fuels can be used in chimineas some are better for some tasks than others. 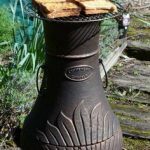 To begin with, cast chimineas such as those made from aluminum or iron can take the heat of charcoal but charcoal should never be used in a chiminea made from clay. 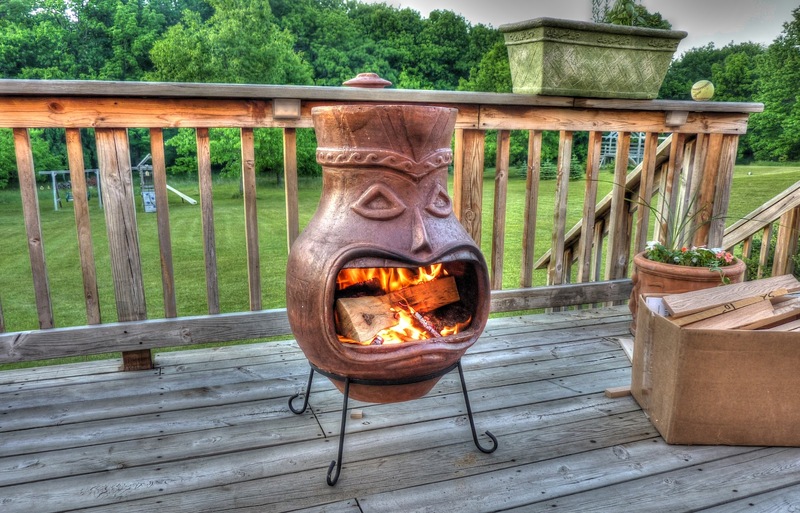 A variety of woods on the other hand may be used in any chiminea. You can vary the wood according to the desired flavour you wish to impart to your food. 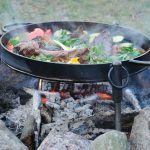 Don’t use soft woods like pine to cook with since they release a toxic resin that may impart a harsh acrid flavour to your otherwise delicious food. Clay chimineas should have a 3” layer of sand or lava stone in the bottom of their basin to prevent cracking from direct heat and dramatic temperature changes. On top of this sand, or directly on the bottom of a cast chiminea, it’s then a good idea to place firebricks on opposite sides of the basin. Two firebricks can serve as a stable base to rest a grate, ceramic tile, or pizza stone on. Some chimineas come with a slide-out or swing-out grill, and if so then you can skip the firebricks. 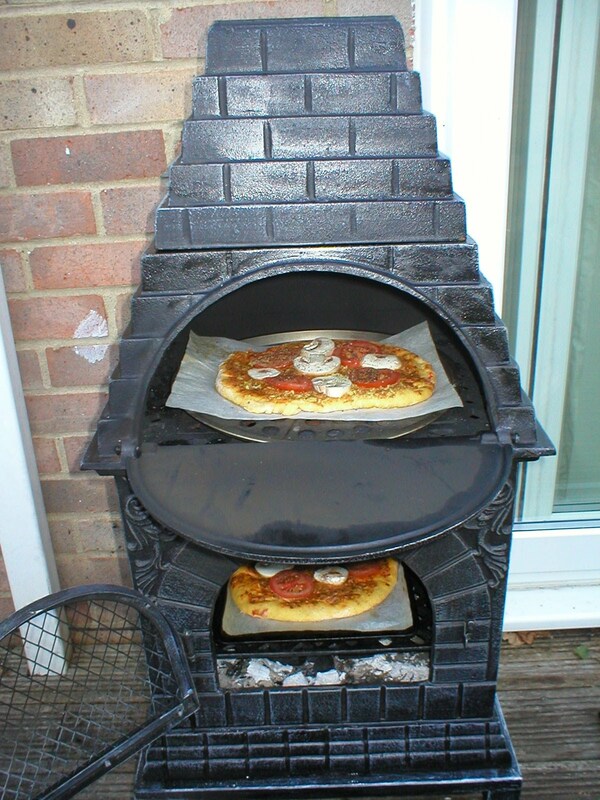 Chiminea-specific pizza stones and racks are also available for purchase. The fuel then goes on top of the sand or in the bottom of a cast chiminea. Before you can start baking you want to light your fuel and let it burn down. Rake the burnt down fuel to provide an even heat. If using a pizza stone or ceramic tile make sure you put it in the chiminea for about 15 minutes to come up to temperature but remember that they’re not designed to handle direct heat so place them on a rack or on your firebricks. Chimineas get quite hot so be sure to use tongs and have a good pair of heat resistant gloves or mitts. One of the most popular things to cook in a chiminea is pizza. One of the great things about cooking pizza in one is that it’s an easy way to stay connected with your guests while you’re cooking. If you’ve made the pizza dough and have your variety of toppings organized ahead of time, then while your chiminea is coming to temp you and your guests can be building pizzas together. 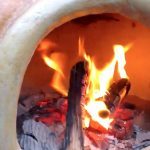 When the chiminea and pizza stone are at temp, just start baking them and making them as you go with whatever toppings and combinations you and your guests desire next. To get a nice high heat charcoal is an ideal fuel but for a clay chiminea or for a wood-fired pizza you can use a variety of hardwoods. For a pizza you’ll want to use a ceramic tile or pizza stone so be sure to let one preheat in the chiminea for a quarter of an hour. Make sure that the fuel has burned down sufficiently and has been raked into an even layer under your pizza stone. You’ll want high indirect heat underneath your pizza. Once your stone is nice and hot, brush it with olive oil or sprinkle it with cornmeal before setting your pizza on it to prevent sticking, then throw it in the chiminea. Keep an eye on it because it will only take a few minutes, though if it’s a wood-fired pizza it will take a tad longer than if charcoal were used. You’ll know it’s done when the cheese on top is nice and bubbly and the edges have browned. For thicker crusts, part-bake them without toppings and then turn them over before loading them with your toppings to ensure a well-baked crust. You should also pre-cook your toppings as needed since your pizza won’t be in the chiminea for very long. Keep in mind that too many toppings will lead to a soggy crust no matter how hot your chiminea is and how long you leave it. The opening of you chiminea will restrict the size of your pizzas. 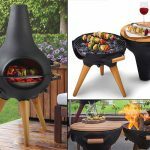 If this is not to your liking there are chiminea-specific attachments that sit on top of the chimney for cooking pizza and grilling on. The ancient Mayans, among others used chimineas to bake their bread. This is a common method still popular in Mexico today. 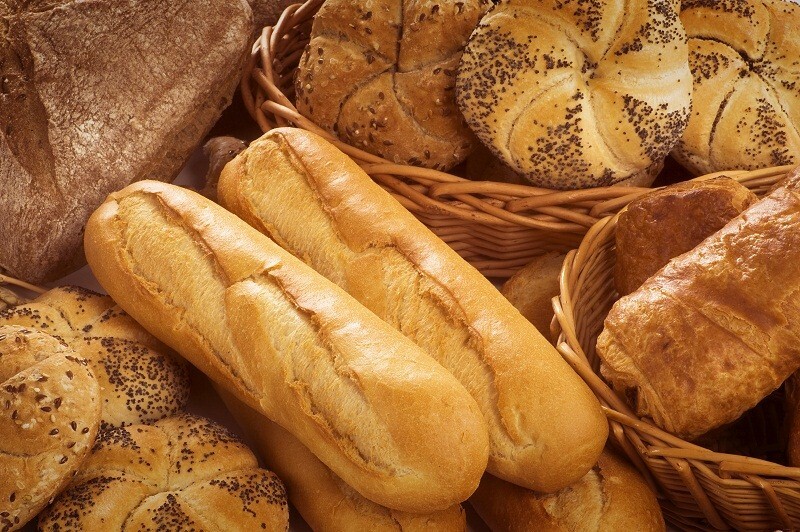 The aroma and crunch of fresh baked bread is hard to beat and chimineas bake bread beautifully. Like for pizza you’ll need to make sure the fuel has burned down and rake it to an even layer. You’ll also need a baking surface. Ceramic tiles and pizza stones are popular choices but cast iron set on the tiles makes a great option as well that results in golden, crisp crusts and sides. 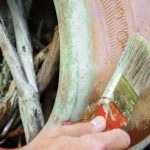 It’s a good idea here too to oil your cooking surface or sprinkle with cornmeal to prevent possible sticking. Flatbreads such as focaccia or naan are ideal for baking in a chiminea because the small oven with lots of heat leads to a quick bake. The only real restraint on what you can bake in your chiminea is how big your chiminea is. Potatoes are a popular choice. Just wrap them in foil and nestle them in the coals. Don’t be tempted to oil the skins first or the result will be soggy instead of crispy. You could bake pies, vegetable bakes, meats, or anything really. 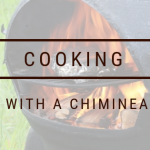 It’s easy to bake an entire meal in your chiminea if you plan ahead. For example you could bake some lamb tikka masala with a side of fresh naan. While you’re eating the main course if you throw in some hand pies to bake you’ll have piping hot pie for dessert! The sky’s the limit so have fun experimenting this summer.